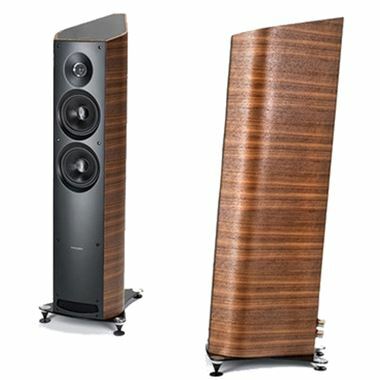 Sonus Faber Venere 2.5 Floorstanding Loudspeakers. Available with Online Finance and Free Delivery. Venere 2.5 is a 2.5 way floor-standing speaker characterised by its Lyre shape, a homage to its 'mother' Aida and at the same time a key element in functionality and aesthetically of high quality. The Lyre shaped cabinet ensures structural strength and control of spurious resonance, creating a listening experience that is clear, detailed and extremely dynamic; the front reflex conduct furthermore makes it easy to place in the listening environment by avoiding unwanted reflection with the rear wall. Equipped with a mid-woofer and a woofer in Curv™, as well as a tweeter with a silk dome created by the German company DKM, one of the most prestigious producers of drivers in Europe, the 2.5 has a baffle characterised by curved lines that allow for balanced housing of the drivers and gives vivid and engaging sound. The inclined positioning of the baffle facilitates its positioning in all environments, and always ensures an excellent listening experience.The tempered glass on the base and top and the adjustable aluminium feet are materials that unite the Venere line and give a contemporary feel to every model. All the speakers in the Venere line are identified by their ease of use and placement in the listening environment and for their impressive ability to 'disappear' leaving the Music as the protagonist. An ideal candidate also for an excellent home theatre system. 1x180 mm Free compression basket design and Curv cone. Ultra dynamic performance and linearity.Sonus faber design. 1x180 mm. Free compression basket design and Curv cone. Ultra dynamic performance and linearity.Sonus faber design.